Place wax paper on a large baking sheet. Set aside. In a large bowl, add all the ingredients for the meatballs into the bowl. Gently, using your hands, mix everything together, careful not to overwork the meat. 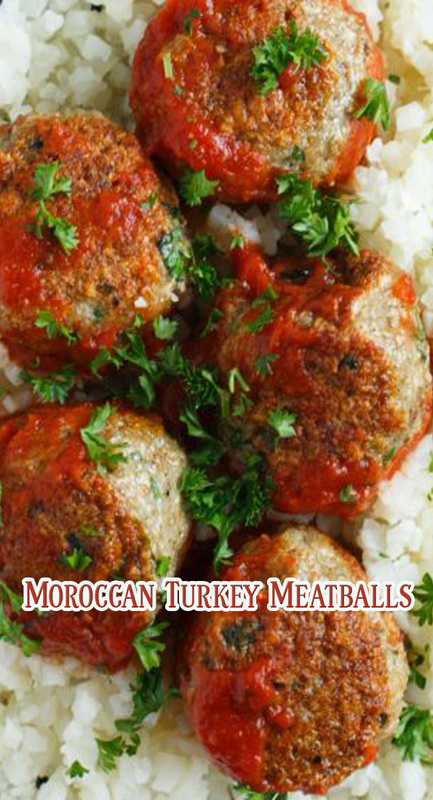 Using a medium scoop, scoop and roll out the meat mixture into balls and place on wax paper. At this point, you can place half the meatballs in a freezer-safe plastic bag or proceed to cook them all. To cook: heat up a large skillet over medium-high heat and add olive oil to the pan. Brown all four sides and cook until meatballs are cooked through, about 7-10 minutes. While the meatballs are cooking, in a small saucepan, make the sauce. Add all the ingredients to the saucepan and bring to a low simmer. Once the meatballs are done cooking, keep in the skillet and pour the sauce into the skillet and bring to a gentle simmer and toss around the meatballs in the sauce. To serve: divide meatballs evenly on a bed of cauliflower rice or white/brown rice then spoon sauce over the meatballs.